While we were gone, I wondered how Legion was doing. I wasn't feeding it twice a week. What I did to try to keep it going was build up the volume gradually over time and then, just before we left, I fed it and put it straight into the fridge. I reasoned that the cold temperature would allow for slower growth. It seems to have worked. When I got home I poured out the excess liquid, scraped off the surface which seemed a little grey, and then fed it. It bubbled. The next step was to make a batch of bread. I started it Sunday night and let it ferment overnight. I got up early on Monday morning with the intention to get it proofing but, in the interim, I'd gotten sign out for my patients and knew it was going to be a long day. Instead, I covered it and put it in the fridge, retarding the dough. Before I got home (and yes, it was a really long day, too long to have the bread proofing) I had one of the kids pull it out of the fridge and then I shaped and set the loaves to proof. Because the dough was now cold, proofing could take longer. 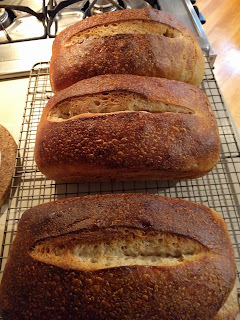 This morning I got up around 5:30 and baked the bread. They didn't have the oven spring they were supposed to have, but they did work, and the bread is delicious, as usual. We've already finished one of the loaves. 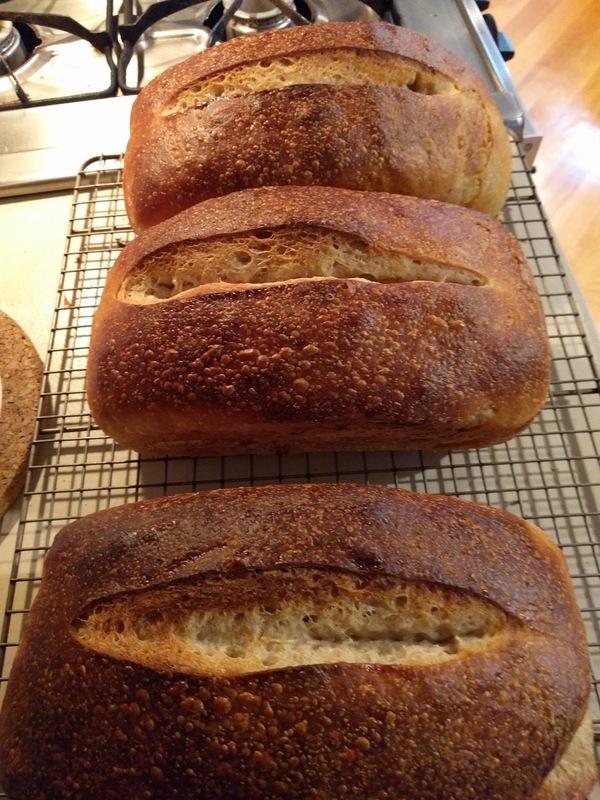 Now that I can get back in my routine, I should be able to get the bread behaving itself with the next batch. Do you think I can take some sourdough starter on a plane?